Shortly after noon last Sunday raw video appeared on Facebook within minutes after multiple Los Angeles Police Department (LAPD) officers shot and killed an unarmed man on the sidewalk outside the Union Rescue Mission on Skid Row, where many of the City’s homeless live in makeshift tents on the street. Within hours, the video had been shared on thousands of Facebook pages and racked up millions of views. While the original Facebook post has been taken down, the video can be seen in its entirety on YouTube. Details, including the victim’s name, age and background, have not yet been released. The Los Angeles County Coroner’s office reports that he is black and in his mid-30s. Andy Bales, president of the Union Rescue Mission, has stated that the victim used the name “Africa,” and may have been an immigrant from Cameroon. According to Bales, the victim stayed nearby and helped Mission workers keep the area clean. Other people have told reporters that the victim spoke to them of having spent long stretches in a mental hospital before showing up on Skid Row a few months ago. A significant number of the homeless who populate Los Angeles’ Skid Row and similar neighborhoods in other major US cities suffer from serious mental illness, and there are no effective programs to house and treat them. Skid Row has been targeted by developers who see driving the homeless away as the key to profiting through gentrification. The officers involved in Sunday’s shooting were assigned to the so-called “Safer Cities Initiative,” an LAPD task force assigned to target Skid Row residents and force them to move out. 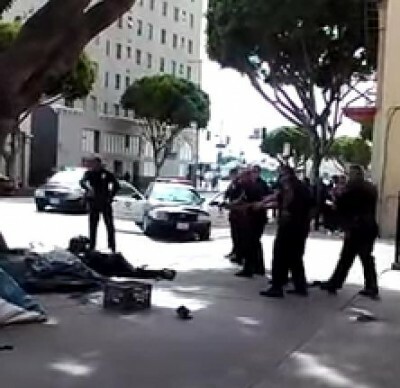 The video, which appears to have been made by a cell phone, begins abruptly with officers rousting the victim from his small plastic tent on the sidewalk almost directly in front of the Mission. As the man spins around, waving his arms harmlessly, surrounded by four officers, a small woman can be seen standing in the background. It is not yet known whether she and the victim were associated in any way. One of the four officers drops his billy club, leaving it on the sidewalk, to draw his firearm. The woman walks over, picks up the nightstick, and holds it as if to defend herself from officers, who by this time have knocked the victim to the ground, piled on top of him, and started beating him. The woman was herself knocked to the ground violently by two officers, as more officers arrived and joined in the beating of the victim. At the 20-second point in the video, the distinctive clicking sound made by a Taser during its discharge of electricity can be heard, and one of the officers appears to be jamming the Taser’s electrodes into the victim. A voice is heard yelling, “Drop the gun!” three times, and then five shots rang out in the space of three seconds. Officers continued to point their weapons at the victim’s lifeless body for almost a minute and a half before one of them finally checked for a pulse, as stunned onlookers became increasingly angry, yelling denunciations of the police. No gun was recovered, and there is nothing in the video suggesting that the victim ever had his hand on an officer’s weapon. The LAPD later confirmed that two officers and one sergeant fired bullets. At a press conference, Los Angeles Mayor Eric Garcetti, a Democrat, defended the officers and called the LAPD “the most progressive force in the country.” He announced that at least two officers were wearing body cameras. Neither video has been released, however. LAPD Chief of Police Charlie Beck immediately rushed to the defense of the officers at a Monday morning press conference, using the same lame “he was going for an officer’s gun” excuse used by Officer Darren Wilson after killing Michael Brown last summer in Ferguson, Missouri. When officers approached, the victim “refused to comply with the officers’ commands and then began to fight with them,” according to Beck. The video clearly shows the officers as the aggressors. Beck claimed that the victim “forcibly grabbed one of the officer’s holstered pistols,” for proof pointing to a blurry screen shot from the video that shows the victim’s hand extended into the air, not touching a gun. Beck did not explain why, if the prostrated man was grabbing at his gun, the officer did not simply stand up, removing it from his reach. Surveillance cameras mounted outside the Mission captured events before and after the shooting. The victim had been involved in a minor altercation with another homeless man. After his tent was pointed out, the officers dragged the victim out, leading to the events captured on the cell phone camera. The surveillance cameras also captured the paramedics arriving and pronouncing the man dead at the scene. Police officers have extensive training on weapons retention, and they use special holsters that make taking weapons away from officers very difficult. No officer in a situation like this one is going to allow a vastly outnumbered, unarmed transient access to a firearm unless he is looking for a pretext to use deadly force. Officers have been known to shout lines such as “Stop resisting” to cover up for their own brutality. Yelling “Drop the gun” signals other officers to use lethal force. Sunday’s shooting is part of a surge in police violence throughout the United States, which is itself a direct response to deepening social tensions arising from the growth of social inequality. According to killedbypolice.net, law enforcement agencies in the United States have killed over 175 people already this year, a rate of about three people a day. In contrast, no police officers have been killed by criminal suspects so far in 2015.